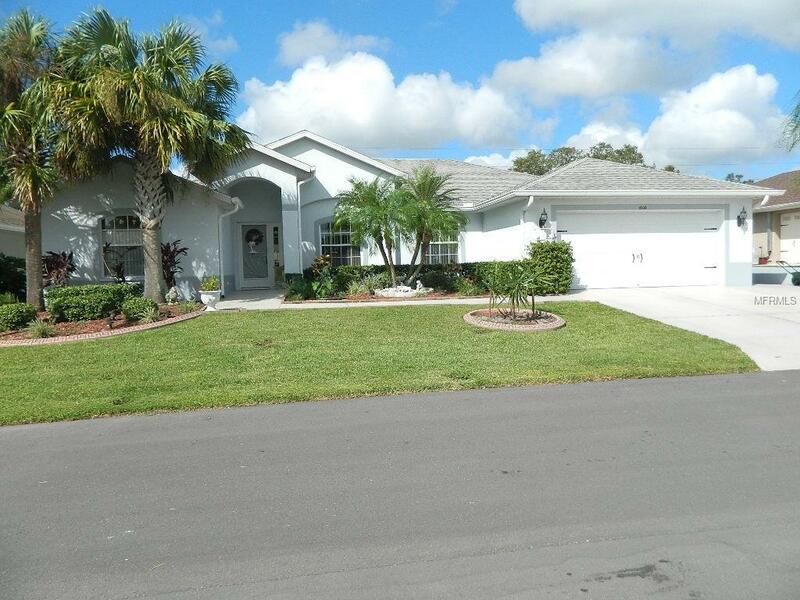 This 3 bedroom 2 bath home is one of the larger homes in Tampa Bay Golf and Tennis Club and comes with a golf cart. The popular Whitington model features a formal living room, dining room, family room open from the kitchen plus an office/den. The two spare bedrooms are split from the master bedroom. The 2nd bath can be accessed from either the spare bedrooms or the laundry room. There is also a separate breakfast nook. This 2 car garage home also features a separate side driveway with a garage door for golf cart parking. Some additional features include a screened front entry door, a year round Lanai with painted concrete flooring and vinyl windows that measures 26 X 11. The master bedroom has his and hers walk in closets. The master bath has a garden tub, separate stall shower, dual sinks and marble counter. The main living areas have solid wood floors with carpet in the 3 bedrooms. This floor plan allows you to have the dining room right off the kitchen or use this room as the family room. All the appliances remain with this lovely home including the washer and dryer and some of the furniture is optional as well. The home is located in Tampa Bay Golf and Tennis Club, which is an over 55 community with 2 clubhouses, 2 pools, one heated, tennis courts, pool tables, fitness center, library, full service restaurant and so much more. There is an 18 hole championship golf course and a 9 hole executive course as well.